Madeleine McCann returns in a story about a man’s death. 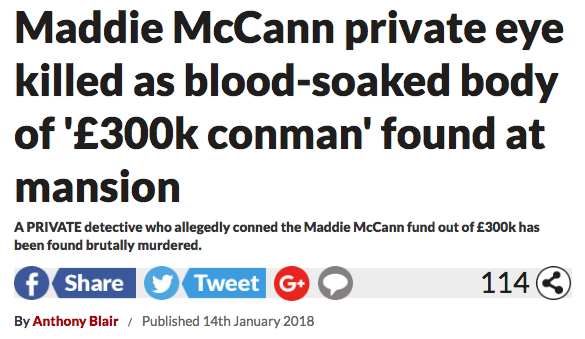 The Star’s front-page headline bleeds: “MADDIE DETECTIVE DIES IN ‘BLOODBATH'”! A PRIVATE detective who allegedly conned the Maddie McCann fund out of £300k has been found brutally murdered. Murder!? The body is that of Kevin Halligen, found at a home in Guildford, Surrey. Hired to look into the disappearance of Maddie McCann in May 2008, he “was later accused of conning the fund out of £300,000”. Accused is not a judgement in a court of law. He allegedly conned the McCann family. But that lacks sensation. He denied misusing funds. “We were called to an address in Cobbett Hill Road, Normandy, Guildford, on Monday following a report of a man in his 50s having been taken unwell, who subsequently died. What about the blood, then? Not went blood, then. Dried, old blood. After being sacked from the McCann investigation, Halligen was arrested in the UK and extradited to America on fraud charges for an unrelated case. He received about $12 million to provide “security, intelligence and public relations”. Trafigura gave Halligen an additional $2.1 million to “hire lobbyists and influence officials in the United States on Trafigura’s behalf”. The next day, Halligen used nearly $1.7 million of that money to buy a large home with a swimming pool.